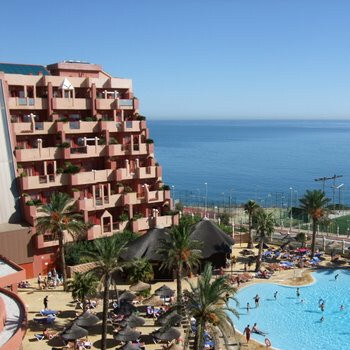 Imagine, lying on your sunbed sipping an ice cold drink beside one of the largest pools in Mainland Spain. Picture spectacular Mediterranean views and sumptuous dinners and you are a guest at the Holiday Village. A resort in itself, the superior standard. We recently returned from our holiday, in general we had a great time the food was good lots of choice for children and vegetarian options the Italiane restaurant was lovely with good service. Children pool activities were fun however entertainment in evening could of been better. Lots of pools and sun loungers however for younger children we found it to big and lively. One concern was the amount of waste produced by plastic cups and plates throughout the day and lack of recycling facilities I think this is one small change that could make a difference. Although we had a nice time we wouldn’t go back. Stayed at this hotel last October myself, husband, daughter and granddaughter 2 who has Down Syndrome. What can I say the holiday was wonderful great weather, lovely food, plenty of choice and hot ,there were always dishes that were cooked fresh to order by chef at hot plate and the waiting staff were fantastic especially with my granddaughter, they love all the children and were always really pleased to see Ella my granddaughter and made such a fuss of her. Pool area great plenty of sun beds and across the road via a private bridge is the huge pool area with plenty of extra space. Of course it might be busier in main holiday season. The only thing against this hotel is the location great if you want to stay here and not walk to bars or shops. Just too far need a bus or taxi. We spent a week at the Holiday Village all inclusive and have to say even despite the piddling rain, it was one of the best holidays we had had. Not sure if we would have enjoyed it so much if it had been August and the resort heaving with holiday makers. It was clean and tidy. Everyone was friendly, just not all the guests to the staff. Food was amazing and so much choice. There was a lot to do in the resort and also in the immediate vicinity. We even went further a field and hired a car to explore Gibraltar which was a great day out too. Would highly recommend this holiday village, especially out of season. Travelled with my wife,brother and 3 year old son. The transfer was about 30 minutes and we were the first to be dropped off.This is an extra for having booked the hotel. There was a large queue to check in but we did not have to wait long.Wine, champagne and fruit juice were provided.Even although we arived around 11.30am our rooms were ready.We booked it last minute and on our arrival found out we had been given "select rooms". These 2 rooms were in the block which was purely accomodation. The other block has the kids club, shop , restaurant and bars etc on the bottom level. The apartments were very nice. A huge bathroom with 2 sinks,a bath, seperate shower, a small kitchen, livingroom come dinning room , bedroom with 2 big beds - not doubles but bigger than a single and a large balcony. We were room 547 and were right at the front on the top level. It had a great private view over the pool and out across the sea. It had air con , Plasma TV ( my brother had an old style) and DVD player. The safe was 2.5 euro a day. The food was nice - its not 5 star but if you can;t find anything to eat you are really fussy. The Italian and Mexican are nice for a change as you get table service. One thing which is annoying is that you can get water as part of the all inclusive everywhere in the hotel apart from the 2 restaurants ,even although they are only about 20 yards away from one of the hotel bars ! The water park where you see the picture of the pirate ship is across the road from the main hotel. It is quite a walk from your room to it - so don't forget to take anything you might nedd or you spend quite a bit of time walking to/from your room !!!!! The main bar was only ever staffed by one person and the queues were pretty long. Again ,here you could not get ice cream on the all inclusive - you had to walk all the way over to the main complex pool bar !The water park was great for the kids. Plenty of slides , fountains and shallow bits so they could play without having to have side by side supervision. On reading about the hotel I was a bit concerned that it sat itself in the middle on nowhere. This is not the case. It is surrounded by other hotels but not by restaurants or bars. Buses run every half hour from outside the hotel to either Beneladena or Fuengirola and only cost 1.25 euro. We walked down to the beach at Fuengirola side which was only a 15 minute walk. My son who is 3 went to the kids club in the afternoon between 4.30pm and 6.00pm. He seemed to enjoy that. Gave us a rest ! Don't know much about the other entertainment but there always seemed to be somrthing going on for the kids. At night we sat between the two hotel blocks outside at the Piano bar. My son ran about and played with other kids. There was normaly a live singer or group on. On booking in the girl told us that there were only 7 empty rooms. The complex is so big that it was not crowded - even at the water park which is open to other hotel guests. I would highly recommend this hotel to families and would certainly go back. The staff were very friendly and any problems I had were attended to right away. We stayed all inclusive, we have never stayed all inclusive before. We were really please with the food with a really good chocie(even thou the kids only had chips and pizza there chocie thou to have it). The rooms were lovely and clean with the sheets changed every other day or if the children's needed it everyday. The Hotel it's self was really clean you could always see staff cleaning. The pools were lovely and clean and lots of chocie, the children loved it just splashing about in the pools. If you went a cross to the pools on the other side you could only get food to sit down type meal which the children didn't always want to do that, if you stayed on the hotel side with only one pool you could get ice creams and food at the pool side. We would go back again to this hotel as the children love the pools and we have a beach at home so the children didn't miss it too much. Staff both hotel and first chocie were very helpful and always happy to help you. Thank you for a great holiday! We arrived on 1st June 2010. First impressions were good, communal areas clean, friendly staff and reps.
Hotel room was large but not clean, sheets were not changed. Balcony unusable due to bird excrement. Staff were lovely, reps were aware of the problems, many holiday makers complained. Not a hotel that I will recommend or return to. The saving grace was the water facilities, fabulous, every day was great fun. Location was poor, it was a taxi or bus to the nearest town, not the 15 minute walk that we were expecting. We stayed here with our three children aged 9, 8 and 6 from the 18/5 to the 25/5/10 and were A.I. having booked through First Choice. It was our first time abroad as a family and we all loved it and wished we had booked for longer than a week. The check in process took no more than 10 mins and was a simple matter of filling in the normal hotel type check in form and either giving in your credit card details as there is a 100 Euro deposit required in case of breakages etc or presumably handing over the cash it does mention this in the brochure or on the website). We arrived at the hotel around midday and our rooms were ready so it was a matter of dumping the cases, a quick change and off to the pool. We were on the 5th floor (the top one). The numerous lifts all have one glass wall so might not be ideal for anyone a little wary of heights if above the 1st floor. Our room had a pool view which normally incurs an extra charge but we had not asked for one specifically. The other option would appear to be a nice mountain view in the distance and this would not have bothered us really. The room had a very large bathroom incl 2 sinks, bath with shower, separate enclosed shower, bidet (much to the amusement of the children ! ), they all have a hairdryer, and more than enough towels which along with the bedding were changed daily. The kitchen was of an adequate size and had a fridge containing two bottles of water, a bottle of coke and orange juice which were also replenished daily. The main bedroom had two double beds, the safe (chargable if required) and more than sufficient wardrobe space. The children had the sofa in the living room which folded down so two could sleep and we had also provided a fold down bed. The balcony was also more than adequate size wise. The room had a T.V (remote via deposit at reception but no money was req to be handed over as charged to cr card if not returned). Room also had air con. The pool at its deepest was 1.95m and had sloping shallow ends. There were always at least three lifeguards on duty who were very attentive. No balls or inflatable lilos etc are allowed in the main pool, only in the separate baby pool. There were always more than enough sunbeds with space for more if req in high season. This then meant no reserving them which isnt allowed anyway before 0900 as per the notices. The Beach Club is accessed via a bridge which crosses over the road and is about a 6-10 min stroll from the main pool. It cannot be accessed by anyone not staying in the hotel. This is were the large donuts can be hired for use on the three water slides and in the wave pool (10 euros for three payable plus a 30 euro refundable deposit). The wave pools current is strong and it stays on for about 20 mins each time and there are sufficient verbal warnings given prior to it being switched on. Again, as per the main pool, there are a sufficient number of lifeguards on hand. Breakfast and evening meals are taken in the main restaurant. You are initially shown to your table by the staff and then you are free to help yourself as many times as you want. We could not fault at all both the range, taste and quality of the food. For breakfast, there was a choice of numerous cereals, fresh fruit of all varieties, pastries including croissants, fresh meats and cheeses and of course bacon, sausage, black pudding, tomatoes etc etc. Eggs were either fried or scrambled or hard boilded and if you wanted the chef would prepare a fresh omlette with your chosen ingreidients while you wait. Toast was available via the self service toasters and tea/coffee available via machines (but not the vending type machines !) along with orange or pineapple juice. Evening meal was the same set up but staff would ask what you would like to drink and bring it to your table. There were themed nights incl Caribbean and Spanish and those who like fish cooked a lot of times right in front of you won't be disappointed ! there were numerous meat dishes and food of all varities too mumerous to mention here and alway a "kiddies corner" consisting of the usual. This resort caters in all aspects mainly for a U.K market so those not as adventourous with their food as us won't be disapointed either as there was a good choice of more recognisable dishes. Lunch is either taken at the restaurant at the Beach Club and is a similar set up to that already stated or by the main pool were there is a variety of snacks incl toasties, pizza, burgers, hot dogs, chips, chicken wings. There are two bars by the main pool incl the one serving the snacks, and two inside incl the one by the evening entertainment area (which moved outdoors the day we were leaving). Alcoholic drinks are local produce (the beer is Cruzcampo and v. nice) and to be honest my wife and I couldn't taste the difference anyway between the spirits! The staff incl those First Choice staff who run the kids clubs were great but go A.I as would be v. pricey otherwise. We stayed on an all-inclusive basis, anyone we spoke to on a self catering basis said it was very expensive.The hotel shop was a complete rip off 3eoros 70 for a loaf of bread! As the hotel is about a good fifteen minute walk for the nearest supermarket people on a self catering basis were forced to pay the prices or 10 eoros for a taxi. The hotel its self was clean,main areas cleaned reguarly.One maid was allocated to each floor,our room was cleaned daily and towels replaced if you placed them in the bath. Balcony area was not cleaned and we only had one chair for three of us, reported it three times to reception and it took them 48 hours to give us another two. The staff were friendly, reception staff were helpfull and first choice staff were excellent. Adult entertainment was a hit or a miss. Kids entertainment was good for young children. Could have done with a disco for olderkids and teenagers tho. All though we were one an all inclusive basis if you went over to the beach club area only the drinks were free you had to pay for food. Some of the activities and areas are only open in July and August.The pools were lovely but absolutely freezing. Our second visit to this Hotel and it was better than the first. The food was hot,plentiful,good choice and well presented. Our room had a lovely sea view and was kept spotless by our room maid. Always had clean towels every day.Plenty of space in the rooms and Air-conditioner worked perfect. In fact it was so good, our son kept it turned on so we had to put blankets on the bed. The Hotel staff were always pleasant and friendly.Just say 'Ola' and they will smile and greet you. The Professional acts were very good,but the Reps entertainment was awful. We just wanted to sit down for a drink,but they embarrass you if you don't get up and act the idiot like a 5 year old. BUT, FLASH was different. What a brilliant man. He was non stop entertaining both kids and adults alike. Every time we saw him we just started to laugh. Beware! you could get a soaking from him, but hey! your on Holiday. The Beach club is NOT a half hour walk,unless you are very overweight and lazy. Just a pleasant 10 mins walk over the bridge. Go to the local beach. Just a few minutes walk across the road. Cheap beds, lovely sandy beach.